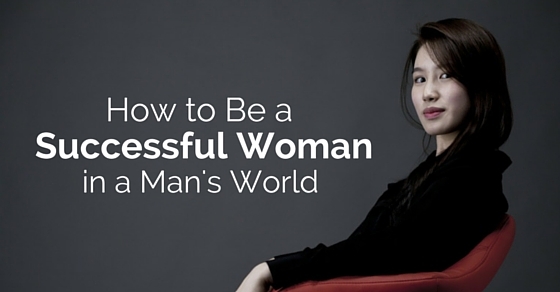 How to Be a Successful Woman in a Man’s World? We live in an era of corporatization and open-minded societal norms. Even in the last few decades, the role of women at workplaces has been gradually overseen. During the old days, women were used to cook, clean or take care of kids only. They were fully depended on men for protection, care and paying bills. But now as we have come a long way, every woman these days want to be successful in personal as well as professional life. Every one of us has our own definition of success. Success always requires the persons to be more proactive in almost every aspect of life. But the path of success is always navigating and tricky. Always try to set yourself on the track of success in your career. It is better to set goals initially. Your goals should be realistic as this will not cause any frustration and unnecessary anxiety. Write your goals on papers and update them as soon as you meet them. Women who have well set goals are known to be more successful in a man’s world. When you tick out each goal that you achieve, you feel strong and successful. This motivates and encourages you to achieve more goals. It is best to tabulate your efforts and create a success chart. If you fail, be open eyed and try to understand where and why you fail. This attitude will help you achieve goals and improve yourself in your profession. Being a successful woman at workplace, you will be heading into the world to displace the interests and values of men. So a woman’s education is one of the most powerful secret weapons. To compete in this world, it is better to educate yourself in various informal ways as well like attending conferences, trade publication and joining professional organizations in the concerned field. Women who are good readers are often more successful. You must also make sure that you possess the right qualifications to succeed in your field. You may opt for crash courses and quick training sessions that help you achieve your goals. Success lies in taking the risk. So don’t be afraid of taking such initiatives. Taking risk doesn’t imply to take reckless decisions, but a successful woman should always know how to take calculative risks. In a career, risks are truly inevitable. You should have courage to take certain risks. Calculated risks are the ones that you take after evaluating similar situations in the past. In some careers like sales and marketing, the amount of risk to be taken could be much higher. Your experience and knowledge will help you attain your goals in such situations. For being successful in this competitive world, it requires frequent updating of one’s knowledge. Generally women are efficient in internet usage but it is better to spend more time on surfing. Such knowledge provides a competitive edge over men. You may be the most knowledgeable person in your field when you begin in your career. If it has to remain so forever, you should work hard and upgrade your skills, knowledge and abilities. A woman who stays updated easily succeeds even in fields that are predominantly male dominated. To differentiate yourself in this male world, one should be able to properly communicate interpersonally. Such skills are always required for a new style of management. Even these tactics put every opportunity and accomplishment in the realm. Interpersonal skills mean the way you interact with people around you. This does not mean just your verbal language. It also includes your body language and expressions. You need to try and develop these skills. Start by speaking in front of the mirror. Work on your body posture and gesture so that you look confident. To work efficiently in this environment, one should not only be confident but also needs to have the ability to succeed. It comes from many sources including education, training and good relationship etc. Good work relationships are often the key as you move higher up the success ladder. You should be able to get work out of people and this means good work relationships with your colleagues as well as coworkers. You must be able to maintain a good rapport with your team. This means that you should also be in a position to give solutions to your teammates’ problems. You must also possess the knack to leave a firm or an organization in good terms. This will help you succeed in your career. Contacts that you develop in the early stage of your career count a lot as you advance higher up the professional ladder. Woman should always remember that disappointment is one of the crucial components of success. Even failure is also a part of this equation. It is assumed that women are over dramatic and melancholic. They are unable to face the failures and they may often give up instantly. If you wish to succeed in a profession that is male-dominated, learn to face hurdles without panicking. A cool head will help you achieve your goals in spite of the challenges you face. To boost your confidence, it is important to maintain meaningful relationships with colleagues, friends and families. Supportive partners can help you in good and bad times. No relationship develops without your investing time and effort. Make sure to meet your colleagues even in informal environments like a coffee house or office team get-togethers. These are ideal occasions when office people get to know each other better. To relieve stress and enhance energy, it is important to take care of your mental and physical health. Most women have a challenging role to play in their professional as well as personal lives. They need to do justice to their domestic responsibilities while succeeding in their careers. To be able to fulfil each of these duties successfully, a woman needs to take time out for herself. She may opt for meditation, Yoga and body massages to rejuvenate. Occasional picnics and travel excursions are ideal for getting rid of stress. You need to be fully passionate about your work. To be successful in this man’s world always be passionate about your profession. If you really enjoy your work, no one can stop you from succeeding. Passion greatly counts. When you choose your career, make sure to choose a profession that you enjoy. Do not opt for an engineering career if you are a passionate writer. If you are made for some particular career, make sure you choose what you are made for. Choosing a different career option will eventually ruin your life. To excel in a profession that is predominantly ruled by men, you don’t just need to equal men, you need to better them. There will be many instances where you will have to actually prove your worth through your actions. If there is a notion that only men can excel in a certain field, you can break the notion only by being better than the men in your field. This means that you need to be perfectly confident and have the courage to voice your opinions fearlessly. Company politics are part of every profession. If you are treading in a profession that is predominantly male, there would be many who want to get you out by hook or crook. You need to be mentally prepared for every challenge. You should know what challenges you may face and how best you can tackle the situation. Understanding what the management fears or why they are against you can help you decide the right moves to face the situation. Once you have decided to succeed, these puny politics should not hamper your will or desire. The best way to succeed is to learn from others. You must have a female role model in mind. Learn from her how to succeed. You must also make sure that you do not repeat the same mistakes that she made. Learning from others’ mistakes can prevent you from making the same mistakes. Most women who do not survive in predominantly male professions give up too early. They get scared of challenges and are really not made for success. It has nothing to do with their gender. The success mantra for men as well as women is the same, a little confidence and the relevant knowledge in their field.